Welder Suit, Welding Apron, Welding Sleeves, Welding Gaiters, Welding Helmet, Back Hand Pad. 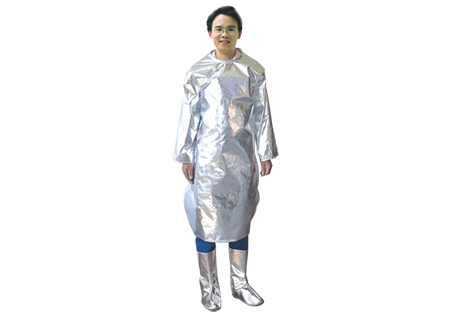 This welding suit offer an all-sided protection, reduce tireness for the operators, it is radiation resistance, welding/cutting, molten metal splash protection, and so on, suitable for every electric welding application. ■	FEAATURES: Excellent Aluminum foil, high tensile nonflammable stitched. Every important stressed area is double-strengthened by layer leather and pot nails structure. The pot nails and buttons used are all electrical and heat insulation. ■	The collar can be turned upright to barricade the splashing of buring dusts from welding, the fire-retardant collar assures you of safety, comfort and sweat-absorption. ■	The upper part of the sleeve, connecting with the shoulder intenal linning brings easiness to put on. ■	The breast leather and design may prevent the burning welding dusts from splashing into the suit, the two-layer leather and pot nail-reinforced structure prevents tearing and separation of the suit. ■	We have other similar unit products such as Welding Aprons, Welding Sleeve, Welding Spats, Welding Helmet. Work as same function.